I didn’t want to read this book. Although I knew it would be well-written—the author works for the New York Times—and informative, the subject hits close to home. My mom is 88, lives in her own home and, except for limited mobility, is in good physical and mental health. I don’t want to think about the day when she might need skilled care. Author Jane Gross says that if a parent is over 85, the question is when, not if, they will need assistance. Most of us like to think that our elderly parents will pass quickly and painlessly. I picture my mom succumbing to an overly enthusiastic session at the slot machines! The reality, says Gross, is darker: a succession of moves and adjustments as a parent’s needs increase, financial resources dwindle, and adult children assume a responsibility for which most are ill-prepared. 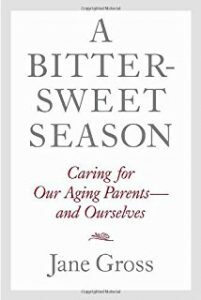 Gross has written her book to help adult children navigate this bittersweet time of life. She tells the story of her own mother, who had been living in a Florida assisted living community when she was diagnosed with a spinal tumor. Panicking, Gross and her brother decided to bring their mother back to New York—a reverse migration that is common these days. Elder care is not for wimps. It is complex, frustrating and time-consuming to sort through. This is a book to read before the crisis hits, so that caregivers can digest its practical advice. For example, Gross urges harried sons and daughters to slow things down. Decisions rarely have to be made in an instant. Taking a few days to process information can prevent a mistake that is hard to undo. The book touches on a wide variety of topics, e.g., the limitations of assisted living, the advantages of hiring a geriatric case manager, the ins and outs of Medicare and Medicaid, and sibling relationships. There is also an extensive list of resources. The only caveat is that the author’s mother makes an end-of-life decision that Catholic readers could not support. It’s a reminder that Catholics need to educate themselves about church teaching on end-of-life issues. Although this is not a book about marriage, it addresses an issue that can severely stress a marriage. Couples with aging parents would do well to prepare themselves for the likelihood of a caregiving role. Although I didn’t want to read this book, I’m glad I did, both for my sake, and my mom’s. Sheila Garcia is the Associate Director for the USCCB Secretariat of Laity, Marriage, Family Life and Youth.